The current world’s honey bee crisis affects agriculture as well as the economy. The Ticino based startup BeeHelpful designs, produces and sells new bee hives and bee managing solutions which can help beekeepers and governments solve the dying honey bee problem. Their product, a new hive, induces new advantages to honey bee colonies. It also proposes a novel point of view to the scientists to understand colonies’ development. 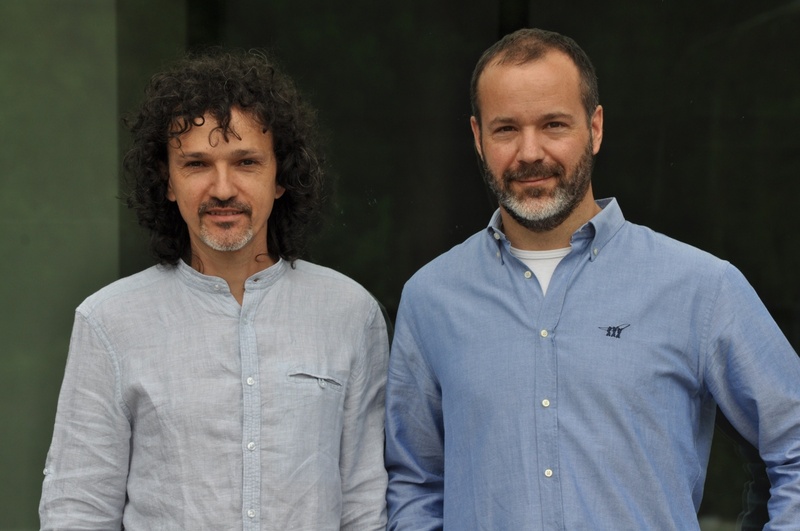 We talked with BeeHelpful’s founders Gianmario Riganti and Alessandro Gamberoni about their startup, their goals and ambition in the Venture Kick competition, in which they just won CHF 20’000 at the second stage. Gianmario & Alessandro, can you tell us a little bit about your background? Gianmario: I’m mechanical engineer and worked 12 years in an entrepreneur engineering consultancy. Right now I’m a teacher researcher at SUPSI and at DynaMat dynamic laboratory. Alessandro: I’m a technical expert and worked 20 years as an entrepreneur on a machine tool design, reselling, and machine tooling sub-contractor. Right now I’m a real estate manager. Before we talk about your startup, could you please tell us, what the honey bee crisis is? Everybody heard about the honey bee crisis but it is difficult to understand why and how it occurs. Just some recipes of this crisis are well known such as the presence of polluting substances, virus, parasites, lack of pollen type, etc. . Our solution offers a different and improvedto the scientists to understand the colony development. .
What is BeeHelpful? What problem do you solve? The honey bee crisis heavily affects agriculture economy by 50% of food value. Beekeepers, Agriculture and Governments are highly expecting a stable solution. The standard chemical based solutions aren’t providing cost effectiveness neither. We want to avoid the lack of profitability of the pollination/beekeepers/food chain. BeeHelpful designs, produces and sells new hives worldwide and bee managing solution. Our solution is capable to definitely solve the dying honey bee problem. When did you found? And what are your milestones? The company was founded in late 2016. Therefore there aren’t many milestones yes. But we will start a new honey bee colony comparative field test in USA / RSA / AU during 2017. We will use the collected data to scale the market. How did you come up with your startup? Where was the idea born? The idea born in 2005 by our self. We were beekeeper and we realized managing honey bees with standard solutions were hard, aleatory, cost ineffective, time consuming and not eco-friendly. The final honey taste was not satisfying. We became a passionate solution finder and we started a 10 years private R&D. In 2005 we entered into the CPstartUP Lugano coaching. How is the situation around bees? How bad does it look? Situation around bees is more and more difficult, except into our hives. USA face a continuous 10 year death ratio around 40% much over the bees reproduction limit. A two to four times per year heavy-chemical-use is required to get alive the colonies. Despite those time consuming operations, colonies became weak year after year. The parasites spread worldwide by globalization increased their killing capability. The chemical solution don’t have room of improvement. Beekeeper became a not profitable work in many countries. Are there any competitors out there? No one is using our strategy. The techniques used in beekeeping are 100 years old, except the chemical development who strongly improved from ’60 to ‘80. Other solution strategy resulted inapplicable after 30 year research efforts made by large research center (USDA, ALP). You won Stage 1&2 of Venture Kick. Who gave you the advice to take part of the VK? CPstartUP coach Umberto Bondi who is still giving us a great support. What did you learn during the Kickers Camp? How was the coaching? The coaching is very business oriented and is made by people with great experience. Transforming a good solution into a good business and attracting the customers requires a modification into the way to think, and many specific know how. Venture Kick coaching was a great support for us to go to the market direction. How did it help you grow your company? The main outputs after the camps were proposing key actions to our solution to the market and milestones definition. Yes, definitely. If you are ready to attack the market and going to do business, Venture Kick is the right thing for you. Stage 3 is coming up. How will you convince the jury to win the final? To convince the jury on stage is a big goal of us. We are working on showing direct results about comparative tests on a worldwide location, using our BeeHelpful system respect standard beekeeping method. We have also some market results to collect. To win Venture Kick Stage 3 is very important and another step to save honey bees worldwide. We know we can do it. What about venture leaders USA? Is it an option too for you? For our case, USA market is the main goal. Getting support from people who daily work with people from USA, who know about culture and the market is a great support. We want to win Stage 3 of Venture Kick. Then we will attend the USA North American Beekeeping Conference & Tradeshow where we will promote BeeHelpful Solutions. Check out a pitch-video of Gianmario, when he talks about his startup.